Your English classes will be closed for part of this week because of Thanksgiving. What are you going to do during the short break? Will you celebrate like Americans? What will you do on Friday? Many Americans will go shopping on the day after Thanksgiving. Will you go too? Right now, you are probably seeing and hearing advertisements everywhere for Black Friday sales events. Black Friday is the day after Thanksgiving, and it is the busiest, craziest day of the year for shopping in the United States. Most people do not have to work on Black Friday, so everyone has time to go shopping that day. All the stores want people to shop there, so they have special prices and deals (low prices). I hear the commercials, but I don’t understand! Help! In the TV and radio commercials, you have probably heard some words that explain these deals, but you might not know what they mean. Here are some of the words you might hear or see in a Black Friday ad (advertisement/commercial). BOGO – Buy one, get one. Sometimes, if you buy one thing, you can get another one for free. If an ad says BOGO 50% off, that means that if you buy one, you can get a second one at half price. The ad to the right is for a BOGO 30% off deal. On Black Friday at Target, if you buy one iTunes gift card, you can save 30% on a second iTunes gift card. Cyber Monday – the Monday after Thanksgiving. When the weekend is finished and people go back to work, stores want to continue making money, so they sell things on their websites. Cyber Monday is the biggest online shopping day of the year. It’s the day when people spend the most money shopping online. cyber sale – low prices only available online. You must buy things from a store’s website to get cyber sale prices. The prices are higher in the stores. 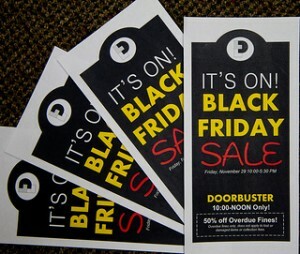 doorbuster deal/doorbuster savings/early bird specials – low prices for people who shop early. If a store opens at 8:00 a.m., the store might have extra-low prices until 9:00 a.m. These low prices early in the morning are doorbuster deals. Listen to commercials closely to find out the hours when you can get these low prices. In the ad to the left, the doorbuster deal does not end at a specific time. It ends when there are no more of these toys. exclusions – things that do NOT have a lower price while other things do. Some ads say things like, “40-60% off everything in the store!! Some exclusions apply.” This means that some things are not on sale even though everything else in the store is. lay-away – the process of paying for something little by little while the store keeps it. If you buy something with credit, you take it home immediately and pay for it later. If you put something on lay-away, the store keeps it until you pay for it completely. When you have paid 100% of the price, you take it home. Not all stores do lay-away. You should ask if you want to buy something expensive. limited quantities – not enough for everybody. The new PlayStation 4 came out on Friday, and they were all gone from every store before the day was done because quantities were limited. Sometimes stores will give you a free gift when you spend a certain amount of money, but they don’t have enough gifts for everyone, so when all the gifts are gone, you can’t get one no matter how much money you spend. night owl deals/specials – low prices for people who shop late. Stores want to have shoppers shopping all the time, but they know that people are tired after work and just want to go home. They have night owl deals so that people have a good reason to go shopping late at night when they’re tired and just want to go to bed. Listen to commercials closely to find out the hours when you can get these low prices. Some stores begin their Black Friday sales ON THANKSGIVING, so after you eat your turkey, you can start shopping! price match – Stores will sell something to you at a lower price if you can prove that another store is selling it for the lower price. 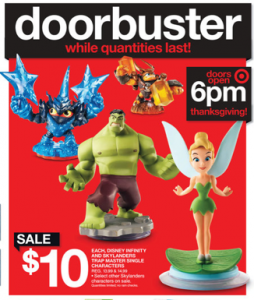 If you see a toy at Wal-Mart for $50, but you get an ad in the mail from Target that says the same toy is $45, you can take the ad to Wal-Mart, and they will sell you that toy for $45. They are matching Target’s price. rain check – buying something at a lower price after the sale has ended. Let’s say you want to buy a toy for your son. You see an ad that says the toy is on sale. Normally, it costs $50, but this week only, it costs $35. You are excited. You go to the store, but they don’t have the toy because other people have already bought them all. They had limited quantities of the toy, and now they are sold out, and the store won’t have any more of that toy until next week (after the sale is over). Ask if you can have a rain check. A rain check is a note from the store’s manager that gives you permission to buy something at the sale price after the sale is over. You can go back to the store next week and buy the toy for $35. Many stores, especially during Black Friday sales, will not give you a rain check. red dot clearance – low prices on items with a red circle. Sometimes, a store needs to sell all of an item to make room for something new. They will sell these items at a very low price because they want people to buy all of them. This is a clearance sale. They might put a colored sticker on the clearance items so you know which ones they are. Usually this sticker is red, but sometimes a store will have different colored stickers for different discounts. Maybe a blue sticker means 30% off. Maybe a green sticker means 40% off. Maybe a red sticker means 75% off. Each store is different, but there are usually signs that explain the different colors. sold out – The store has sold all of something. There are no more. steal – a very good deal (a very low price). Normally, “steal” is a verb that means to take something that is not yours. In this case, a steal is a deal that is so good, a price that is so low, that it feels like you are stealing it (but you aren’t). If you buy a new, 40-inch, flat-screen TV that works perfectly for $75, that is a steal. while quantities last/while supplies last – until there are no more. When a store has limited quantities of something, you can only pay the low price for it while the store has them. When there are no more, you cannot buy it. They might receive more next week, but the price will be higher (regular price). 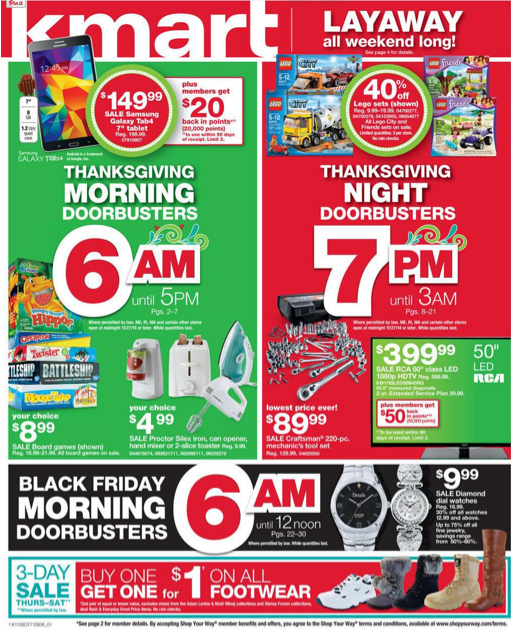 How many of these Black Friday words can you find in this K-Mart Black Friday ad? As we learn about the calendar, we also learn about holidays. Holidays are days that we celebrate or honor a special event or person. Some holidays are religious like Christmas or Easter. On some holidays we honor and remember groups of people like Memorial Day (America’s soldiers), Labor Day (workers) or Mother’s and Father’s Days. Some holidays are just plain fun (St Valentine’s day, Mardi Gras, Halloween, New Year’s Eve). We don’t always have a day off for a holiday but on federal holidays, banks and most government offices are closed. Write a comment and tell us about your favorite holiday and why you like it so much. Many towns have parades with bands playing marching music. Soldiers and veterans march in these parades. People visit cemeteries and put flowers and flags on the graves of fallen soldiers. The American flag is flown at half- mast ( mid way on the flag pole) until noon. The National Memorial Day Concert takes place on the west lawn of the United States Capitol and is televised to the nation. Learn more about this holiday and practice the vocabulary used to describe this holiday at this site => ESOL Courses – Memorial Day and at the El Civics site. and this video wordlessly makes us realize the tremendous sacrifice that our military service people and their families have made for America. Is there a special day, like Memorial Day , in your country to remember the soldiers who have died? What are the customs in your country to honor them? On a lighter note, Memorial Day creates a three-day weekend for many people and marks the unofficial start of summer. Many beaches and parks open up for the summer on Memorial Day week-end. Friday, February 14th, 2014 is Valentine’s Day. It’s a day we think about the people we care about in our lives – both friends and romantic loves. People exchange “Valentines” ( notes expressing friendship and love) ,and gifts ( especially chocolates, flowers and jewelry). Most of all, people just take the time in their busy lives to say ” I love you” or ” I like you” to others. Click on this El Civics lesson to learn more about the holiday => Valentine’s Day. Here are some words / espressions we hear around Valentine’s Day. Do you know what they mean? Talk to your classmates and see if you can make a sentence using these words. What’s you favorite romantic song?